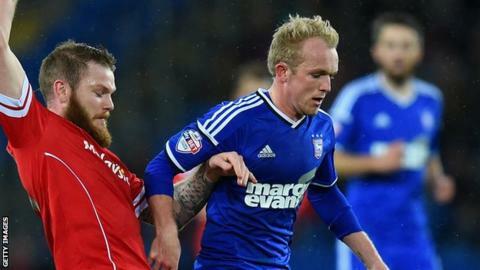 Ipswich boss Mick McCarthy is doubtful midfielder Jonny Williams will feature again during his current loan spell. The 21-year-old is recovering from a groin injury with his parent club Crystal Palace, with his Town deal set to expire at the end of December. "It might be four weeks to get him back training," McCarthy told BBC Radio Suffolk. "It will probably take him to the end of his loan. I think Palace want to have a look at him themselves." Williams was injured in the 1-0 win over Watford two weeks ago and was forced to sit out Wales's international matches this month. He had featured five times for Ipswich since joining in October and had impressed in a central midfield role, but McCarthy expects Palace boss Neil Warnock to retain the youngster. "Palace have called him back. Their physio wanted to have a look at him and now they want him to do his rehab there. Which I understand," he said. "Whether that will take him to the end of his loan, I don't know, but they've got recall on him anyway. I think they need all hands to the pump."